We have been cooking with a cast iron for over a year now. Our reasons for switching from standard non-stick cookware were based primarily on health considerations and the confusing information we had read on the chemicals used in the non-stick coating. Before switching to cast iron, we had been using a 'green' non-stick version that had eliminated the controversial PTFE (Polytetrafluoroethylene) and PFOA (Perfluorooctanoic acid) coatings. But we didn't think it held up very well and just started worrying all over again about the various other chemicals used to create this new form of non-stick. So we made it very simple for ourselves and went back to the 'original non stick' - cast iron. Cast iron possesses no potential dangerous coatings, will not chip or scratch and is also a great way to introduce trace amounts of iron into your diet.And if that wasn't enough incentive, cast iron is also very affordable. A twelve inch skillet for example is less than $30 (here) and it will last forever. Cast iron is also great to cook with as it distributes heat evenly. We primarily use a pair of large and small skillets for everyday cooking. We also use a cast iron dutch oven in place of a crock pot for stews, slow roasts and soups. Our remaining cookware consists of copper-bottomed stainless steel sauce pans. We purchased our Lodge cast iron skillets pre-seasoned. Every several months, we re-season them by coating with oil and baking in the oven at 350 for 45 minutes. After 45 minutes, we turn the oven off and let them cool on the oven racks. For daily maintenance, we soak the pans in warm water after each use. We then scrub with a scouring sponge, rinse with hot water, and pat dry. Occasionally, we also rub a light coating of oil into the skillets while they are still warm from rinsing. We follow the same care with our Dutch Oven. With cast iron it is recommended to not use soap and to not soak in water for long periods of time as this promotes rust and deteriorates the seasoned condition of the cookware (which makes the cast iron non-stick). In the worst-case scenario, you just have to re-season the cookware as described above. Like all choices we make in life, we strive to find ways in which we can live by the healthiest means possible. Some choices are easy to make, some take effort. But we are passionate about creating the healthiest life for ourselves and our babies, so the transition to cast iron does not feel like extra work. In fact, it offers quite the opposite for nothing outweighs peace of mind. I have my Grandma's cast iron skillet and nothing beats home made corn bread baked in that! I love my cast iron pans. I have 2 cast irons pans that have been passed down. 1 came from my great grandma and other from my grandpa. Every time I use them I think of them, all the meals they cooked and the conversations they had with my relatives before I was even born. Such history! The cast iron passed down from our grandparents is so wonderfully seasoned. We discovered a healthy and delicious recipe for vegan cornbread and it cooks up beautifully in our cast iron skillet. I inherited some cast iron and I love it! Like you all, we switched from non stick several years ago, it's just not worth the risk in our opinion. I love the way my stainless steel and cast iron cook much better anyway. I did notice that I couldn't find any cookie sheets that were not non stick when I recently went to buy some new ones. I'm thinking I will have to go with commercial grade sheets in order to avoid the non stick coatings. Williams-Sonoma sells cookie sheets without non-stick coating. They are excellent quality. I've been very pleased with mine. I love this. I have been giving so much thought lately to what we eat, how we prepare it and where it comes from. We were somewhat forced into making more thoughtful decisions about food, but I am so glad it happened. It spurred on this whole new awareness to the enviroment around me...whats in those nonstick pans anyway and do I really want it going into my body? I think not. I am slowly, (as in I have one now and will buy more as I can afford)swapping out all our non-stick for cast iron and stainless steel. I only wish I had "thought" of all this sooner. Thank you so much for posting this, Trina! We were talking about switching to cast iron just a few days ago, for the same reasons you mentioned. I think what holds us back is the thought of eggs and such sticking to the pan and making a mess. Also, because I didn't know about how to season cast iron pans. So, this post was a big help! Ditto -- nothing beats cast iron, seriously. We adore ours. Our reversible grill gets used so much that it rarely even gets put away. Great stuff. Our family also uses the Lodge Cast Iron Skillets - they are amazing! :) It's nice to know we are not exposing ourselves to "extra" unnecessary chemicals! Take care and have a good night! thank you for this important issue. i am also constantly worried about those tef_lon coated pans as they get scratched so easily. we are eating healthy and mostly organic food and it might be contaminated with those horrible chemicals. convinced! our next pan will cast iron. The food also cooks better!!!! Non stick are a definite worry because they start lifting with the firs use! I have also been using some enamel pans we have and as long as you warm the pan before putting oil in they are wonderfully non-stick! I just bought a new non-stick pan - didn't know they could cause problems. When I was a child, the cast iron ones were the only pans we had so I have always thought of them as having been surpassed. I guess my next pan had better be a cast iron one. Wow...I am so glad you wrote this post because we are about to purchase all new pots and pans because all of mine are scraping. Thanks so much for the info on cast iron!!! When I set up housekeeping my grandmother and mother gave me each one that had been my great-grandmothers! They are smooth as silk. A lot of times I don't even wash mine, just wipe out good with papertowel after draining greese off. I always use lard to season mine...a thin smear. I do soak if for some strange reason (didn't heat the pan hot enough before putting meat in or didn't cook on a side long enough before turning...and then I do a smear of Lard and warm it on burner a minute or two or in warm oven to melt good and let it cool on burner or in warm oven. Nothing cooks better!!! We have several Lodge skillets and a dutch oven! Love them. We made the best taking french onion soup just recently in our dutch oven. And, I agree with the reader above. Nothing beats it for baking cornbread! This was really helpful. I have a cast iron skillet, but I've always been confused about how to best care for it. Thanks for the tips! We love cast iron cooking too! I worried about the chemicals in our non-stick pans, so we ditched them a few years ago. For soups and stocks I like my Le Creuset stock pan. Thanks for bringing this topic to the attention of your readers. I have my grandmother's cast iron skillet--now over 70 years old. Cast iron is the perfect cooking medium and we use it all the time. I don't trust any of the non-stick pans. I have two Lodge cast iron skillets that we have had forever! In the early years of our marriage my husband called on Lodge manufacturing and bought mine at that time. They were a family run business and after all these years it is wonderful to see the still make products we can trust for our families! Thank you for sharing! I've cooked with cast iron skillets for years. sponge. Cleans up very nicely. Love cast iron! While I love my Iron-Clad, my iron skillet has always been my favorite. I also have 2 dutch ovens that I love. If you are going to store iron, putting a layer of salt will keep the moisture away. Michele, Thanks for the tip on cleaning with salt - that's great! Maarit, We use olive oil but it is recommended to use an oil with little flavor. We have the same range and we just try to not drag the cast iron over it. Sometimes the old ways really are the best!!! I love my cast iron pans! They do cook food differently, requiring a bit of patience at first - once you get the hang of it they work nicely. You've reminded me to oil mine! :) I agree regarding the nonstick pans.. I worry about the 'green' coating wearing off. Nice post! I recebtly made exactly the same switch, and I am very happy I did. Thanks for this post! Love cast iron! There is something to be said about how things use to be done by our elders. Some new ways are good but most might end up hurting us in the long run. I am a fan of "old school ways!" I LOVE my cast iron skillet!! I would NEVER use anything but! They are classic, and YES, non-stick, if they used and cared for properly. I love my cast iron as well. There's so many different opinions about seasoning. The biggest one today is the use of Flaxseed oil. Although it does work, it's a little on the expensive side and doesn't seem to be any better than using vegetable oil. There are good articles about the pros and cons of Flaxseed all over the internet. cast iron probably doesn't emit bad things into the atmosphere like the other pans you mentioned, when being produced or used in the household. i think that food tastes better cooked in them as well. as a person who has had cancer multiple x's, it's the little things you do & become aware that can turn it all around. i love the fact that you are careful in the things you use for the babies. they are blessed and so are you and mike. This post makes me excited. My father went to college with Henry Lodge of Lodge Cast Iron. His family and his business are both great! We cook w/ cast iron, too, except for fried eggs. Do you do your fried eggs in cast iron? If so, any advice would be appreciated. It was just suggested to me by my doctor to use cast iron to help with my low iron during pregnancy. Great post! We love dutch oven cooking! Cast iron is the greatest cookware and once you buy a piece, it will last you for the rest of your life! Now that's a bargain. My favorite piece was passed down to me from my grandfather. He had the pan sandblasted which made it ultra smooth and more non-stick. It is solid black with years of seasoning. I also use mine on a glass top oven every day and have had no problems with careful usage. I have a nice collection and love every piece! I love using cast iron, for the health reasons that you mentioned, as well as the fact that nothing beats cast iron when baking cornbread and upside-down pineapple cake! When I finish cleaning our cast iron, I always turn the stove burner on low to dry, and often rub a little oil on it also. I learned that from my Mom and Grandma. Eggs are the trickiest for sure. We don't eat a lot of eggs so I'm sorry to say that I don't know of a great trick. Perhaps someone else has one! I've read not to use water to clean them, is that not true? I use course salt and a sponge, but its sometimes a little hard. I have 2 different size cast iron pans, 1 is simple to clean the other not so much and I cant figure out why! Is water ok? We just soak some warm water in it after cooking and then scrub with regular sponge. We use a scouring sponge and a little mild soap if that first step doesn't get everything. Soap is not recommended as it will remove the seasoning. But if that's the case, just re-season. We do use a little water but don't let it sit for too long (water promotes rust). I like the suggestion from Michele to use coarse salt - we'll be giving that a try for sure. We also ditched all our nonstick pans in favor of cast iron a few years back and love it! The preseaoned ones make life so much easier. I can never seem to get a good coating on the pans you season yourself. We love our cast iron skillets...everything seems to taste better when cooked in them too, especially pancakes! I love my Lodge cast iron pans. I am also using my Mother and Grandmother's Lodge pans. They do last forever. My mother used cast iron all her life. When I got married, she gave me her oldest skillet. It was worn thin, so it must have traveled through three generations! On my non-stick pans, I use olive oil in a pump-up spray bottle. I inherited my Mama's cast iron "cornbread" skillet. Basically, I reserve that skillet just for cornbread and it makes the best ever! I have purchased Lodge cast iron skillets for other uses - I bake the best Ozark Mountain Apple Cake in one (recipe on my blog) and they're great for frying the occasional chicken. How funny. I just tried cooking with my new cast-iron skillet for the first time. Loved it! We cook 95% of our meals in cast iron in various sizes. I always wash them last with warm water and a coarse sponge then towel dry and add a drop of olive oil rubbed in with my finger tips, then hang on the wall for the next meal! My mother and grandmothers did so as well! I inherited my great-grandmother's ten-inch cast iron skillet and another great-grandmother's cast-iron dutch oven. They're two of my most prized possessions. I have wanted one for ages but they are so hard to source here in Australia. I'm going to search again! I love my Staub pots. they are enamelled cast. Thanks for this wonderful information...I think this is the way to go! I had to come back and say that I relooked and found some in AUS that were the rounder looking ones (PRO LOGIC) but were $65 each before shipping. Now I have just ordered some from chef's catalogue, they have a flat rate of $19.99 for shipping to Australia for purchases over $100. I have taken full advantage of this, ordering 2 sets of the 2 pack( a 10.5" and 12"), I currently use 2 of the scanpan 32cm ones at a time, they are looking jaded and a bit 'peely'. I am so pleased I looked again. that is amazing shipping charges for such heavy items. I just hope they don't contact me and say it's a problem because of the weight. I hope this helps any other Aussie readers. I use cast iron too and love my pans. I do sometimes wish they were a little lighter, but they don't bend, warp, or get nicked - all thanks to their weight. I use mine everyday. If you don't inherit try a yard sale. They are dirt cheap and can always be re-seasoned. I too love my cast iron. The runner up is my WS copper crepe pan. For cookie sheets I use parchment paper, after cooking I use them to line the tins I keep the cookies in. I've returned to cast iron cooking after many years of non-stick, too. I love the way food cooks in it and I think there's something different about the taste! I've added new pieces when my Fred Meyer has a sale. Love the 'buy one, get one free' or 'second at half price'! Cast Iron makes me think of yummy, southern cornbread....Y-U-M!!! Great post Trina- I've been looking for an excuse to get rid of our old no-stick pans and simplify our teeny kitchen. This is a great solution! This is a fabulous post. It brought back memories of watching my mother cook. I have wondered about that ....... the cast iron has been around longer, is more durable and ya know what? It is way more attractive than the other. I have been cooking with cast iron skillets for over 30yrs. It was always my go to skillet. The only coated non-stick I have is a 17" griddle used for pancakes. All my other cookware are stainless steel pans which I have had for over 30yrs. Coated pans just don't live upto that kind of life span...I have replaced my griddle at least 3 times and that is after they have long since gotten real bad. I enjoy reading your blog. 1. Rub the pan with fine steel wool. 4. Add enough kosher salt to form a liquidy paste. Wearing a glove, crub with a thick wad of paper towels, steadying the pan with a potholder. Repeat steps 3 and 4 until the pan is slick and black. 5. Rinse the pan thoroughly in hot water, wipe dry, and then coat with a thin film of vegetable oil wiping off any excess oil with paper towels. you will never go back. we are stocked and loaded...mostly used cast iron pans. in the city and in the country. Thank you for this post! VERY useful and helpful information. I agree about the health issues with the other pans. Healthier and happier to rid our sweet homes of chemicals. Love your blog and home! Yeah for cast iron!! It is heavy but the reward is so much more worth the trouble! Flavor of food and the added iron intake...as well as safety! Yay! My mom has always cooked with cast iron....and her mother, too. Me too! For years I have used the cast iron frying pan I inherited from a friend! They are amazing ...and heavy! Love this post. My inherited cast iron skillet is used so often, I just keep it on the stove top. We use it almost every morning for fried eggs. Just put a little butter in the pan, open egg gently onto warm pan, poke the white with a knife of fork, then place a cover that is too small for the pan over the egg. Leave it for a minute or so. It will cook and lift off the pan more easily. Remove cover, then turn egg over for a moment to finish it off. Delicious! Going green in the kitchen TIP ! I just switched from plastic bags to cotton draw-string for the produce. Love It! Just spritz the bag occasionally outside or inside. The produce lasts much longer and stores in less space. About 6 months ago I decided that we weren't using our cast iron skillet enough. (It was sitting in a drawer until we wanted it.) Now it sits on our stove. Easy access makes us much more likely to use it. And, let's face it. Things taste better made in cast iron! We have a 12" skillet, a small camp stove, and a large camp stove. (We love to tent camp and it's wonderful to have a chili, stew or pulled pork in the large one, while a cobbler cooks in the small one for dessert! I love cooking with cast iron. Aside from being the healthy option, they are inexpensive and only improve with age. You also get an upper body workout lifting them. What's not to like? I too, love my cast iron cookware. They were all inherited from my husband's grandmother, which of course makes them extra special. My absolute favorite is the dutch oven. Some of our favorite meals (coq au vin, boeuf bourguignon, chicken noodle soup) just wouldn't be the same without that big heavy pot. I love your white house. I need to paint some rooms in a little white cottage and as you know all whites are not alike. Can you tell me which white paint you use? Thanks bunches!!! This has been a concern of mine for quite some time Trina. I have been wanting to get the cast iron pans and this has been the push I needed. Thank you for this informative and encouraging post. And its true...food does taste better in cast iron! We've used Simply White by Benjamin Moore throughout our house. Semi-gloss on doors, trim and windows...eggshell on walls in kitchen and bathrooms, and flat on all other walls. Nothing like cast iron. I use Le Creuset; and while I do not have a full set of it, I do use two major sizes that work for my household. I may get another. But there is nothing like cooking with it! Name is Liz. Good reminders and hints. I'm looking at health issues too. Next is the health of a wood burning fireplace-looks like its not healthy! 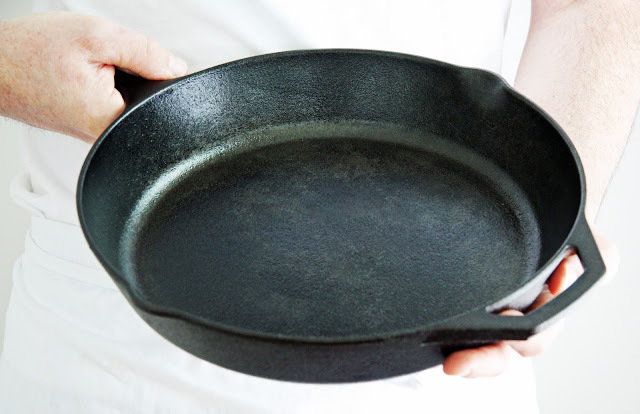 When I was diagnosed with iron deficiency anemia, my doctor "prescribed" a cast iron skillet for me to cook out of. Think I need to break mine back out. My grandmother and mother used to cook everything out of theirs. I remember they were so easy to take care of. The one I have now, nto so much. Probably not a real authentic one like they had. I am so fortunate to have a lovely collection of cast iron that I've inherited from my maternal grandmother, my mother-in-law and a friend. I have several stock pots that I use frequently for soups but my cast iron is used regularly. It is forgiving, as I probably do not season it often enough. Each piece has special memories for me. It makes me happy to have enough pieces that I will be able to pass down something to each of my children as well. Thank you for this informative posting! They have arrived, within 7 days, fantastic! I seasoned 2 of them again (I am not all that happy with the job I did!) and then I have cooked bacon and eggs in them -yummo and fabulous taste. I can highly recommend that supplier above, when I read the shipping cost on the invoice it was an actual 77 dollars, but they had sourced a flat rate of 19.95. Unbelievable! Thanks for the post - so helpful! I'm on a similar journey. Love your posts about food and health! We have been fans of cast iron for years, and my husband in particular loves Lodge Logic cast iron. It's reasonably priced, and in addition to all the reasons you mentioned above. It virtually lasts forever! When I married 25 yrs ago both my mom & my husband's grandmother gave me a well seasoned cast iron skillet they had used for years. I never use my other skillets I love them! I also eventually found out what a great gift it was when I bought a new skillet for mayslef when I wanted a larger size. It takes time & use to get the well seasoned non stick skillet. It was such a thoughtful gift to a new bride rather than giving an amateur cook a skillet I would have had to season myself. I never have to reseason the skillets they gave me but my new one does still need to reseasoned. My mom inspired me to use cast iron..she is dedicated! she wrote a cookbook and has a website dedicated to cast iron (www.castironpam.com). I am interested in your comment that you get traces of iron in your diet from your cast iron pan. I used to think that too. I use only cast iron skillets. I also read somewhere that ages ago they used to stick iron nails into apples and let the apples soak up the iron so that they could eat the apples and get iron for their bodies. Then I read...I wish I could remember where....it may have been Norman Walker...who said that the body could not use iron in this manner...it had to come from plants. I wish I knew the truth. My reading has suggested that it is only trace amounts of iron that the cast iron contributes to the food that's cooking in it. I haven't read into it in great detail so I'm afraid I can't offer more information for you. It does make sense though that eating lots of spinach would be a better source of iron in your diet. Either way, what gives us most peace of mind is the absence of chemicals...the iron is just an added bonus as I know that iron deficiency is quite common in the United States, especially among women. I love using my cast iron skillets. I own 4 and rarely use any other type of skillet. Like you, I like the fact that there is nothing harmful with these skillets. I've just recently found your site. Just wondering...I've used cast iron skillets all of my married life(just celebrated 40 years), but can they be used on glass cooktops? I've noticed that you have an electric range & that's what is available where we are moving. Your input is greatly appreciated. We do have a glass cooktop and I'm sure it's not recommended to use cast iron with it due to scratching. We just avoid sliding the cast iron on the stovetop to keep scratches to a minimum. I am a lifelong cast iron skillet user. My father, born 1914, was careful to train me in the care and cleaning of his mother's pan, which I now have. In cleaning up his effects(hoards, really) I found in the basement a rusty cast iron waffle maker designed to be used on a cast iron stove. Our lake house had a monster cast iron stove which my mother removed in the late 60s. It was so much fun to make pancakes on it! I had never before seen the waffle maker. It sits on a stand which fits over the burners and rotates on a ball joint so you can flip the waffles. It will work great on my heavy duty gas stove. I think I will need to wire brush it to get it to the point I can season it. I also am a big fan of Pyrex storage containers with glass lids. Pyrex is oven & micro proof, so I like the convenience as well as safety. I like the vintage stuff. I gave up on anything but Nordicware aluminum baking sheets. I find that nonstick is never really nonstick and scratches the first week you own it. Aluminum conducts heat evenly and, while it can discolor, it is not dangerous and it lasts. My other pots and pans are either All-Clad - which I've had for 22 years - or enameled cast iron I bought when I lived in France - similar to La Creuset, but cheaper. I have often wished I had my Grandma's cast iron skillet's. I love your country farmhouse. I just joined your blog as a follower and hope you will drop by and join my NEW blog too. It's all about farm life, decorating, cooking, animals, and lots more. Hope to see you there!! We also switched to cast iron this past year....it's been the best decision we could have made. Not only was I concerned about the danger of teflon, I was tired of continuing to buy new pans when they would start to peel. I have about 7 different size cast iron pans and can't believe that I waited so long to take them out and start to use them. Best decision...I'll never use anything else!!! We are cooking on cast iron and stainless steel now for the same type of health reasons. More often than not, we use the cast iron and while it takes a little to get used to again. Wow, we just love it. And with a good layer of seasoning you really don't have to worry about your food sticking. We would end up with scratched up and scuffed Teflon after only a few months back when we had those types of pans around. cook ware as these are very hard and easily heat up and make super tasty food. Actually these are made in Foundry with High Pressure Moulding Lines which give them solidity.